north Georgia, but I’ve mostly been hiking in a hazy, cloudy fog situation. Still, despite all of that, I love it. It’s really a life of extremes out here. It’s sunny, then it’s really cold and rainy; wind is gusting and then it’s calm. One minute you’re really happy and bouncing down the trail, and the next second you’re crying. It’s wild. 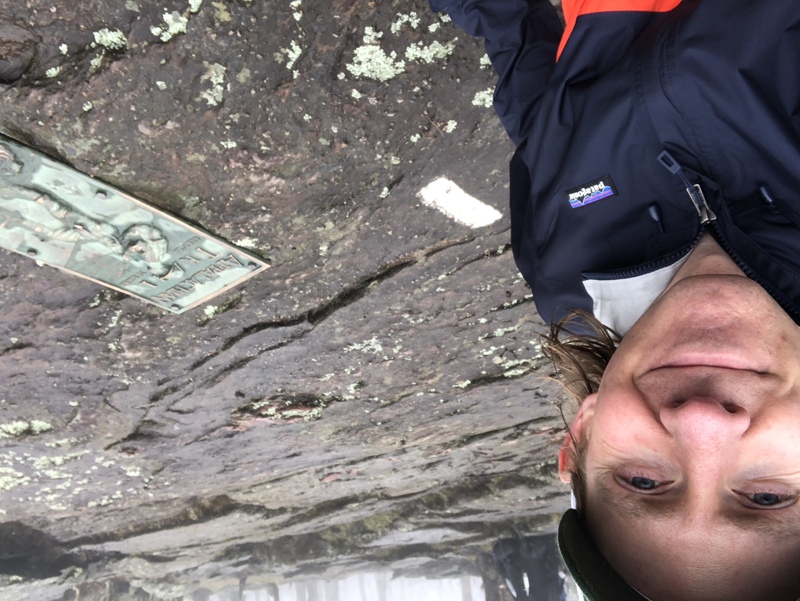 On Monday, March 19, I registered as thru-hiker number 1,220 at Amicalola. Michael hiked up the endless steps to the top of the falls with me (all those years in a fourth-floor walk-up really paid off), and we said goodbye. Honestly, it was awful, and I’m crying right now writing this. But we made it through that moment, and we will make it through many more as I keep heading north. I felt quite alone as I walked the approach trail. The weather wasn’t great, and I ducked into a shelter to eat lunch and luckily also dodged a crazy hailstorm while I was in there. And that was where I met the first person since the tear-filled goodbye. It’s amazing how just talking to someone can change your whole day. A quick chat in the shelter while waiting out the storm put a spring in my step and I made it up to Springer pretty quickly. And there was no one else there. I realize how special it is at this time of year to be alone at the first white blaze, and I took the time to sit there and remember why I’m here and why I’m doing this. Then some loud kids showed up and ruined it all, but at least I had my moment. The first white blaze on top of Springer Mountain. I spent my first night at Stover Creek Shelter, and I met two guys I’d spend most of the week with: Red Coat (Mark) and Ryan. I crossed paths with others many times, but these two guys were a constant, and I’m so happy for that. 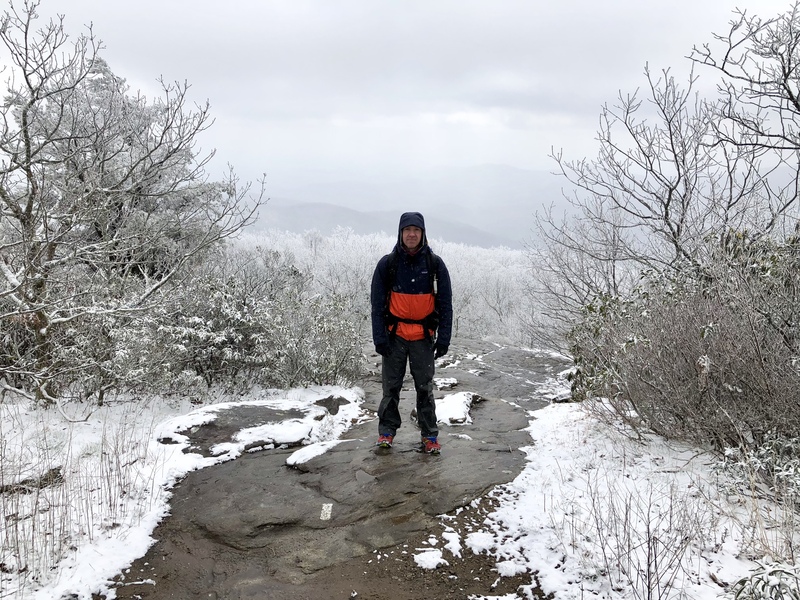 We froze together the next night at Gooch Mountain, and we made it over Blood Mountain in an awful day of snow and wind and below freezing temps. 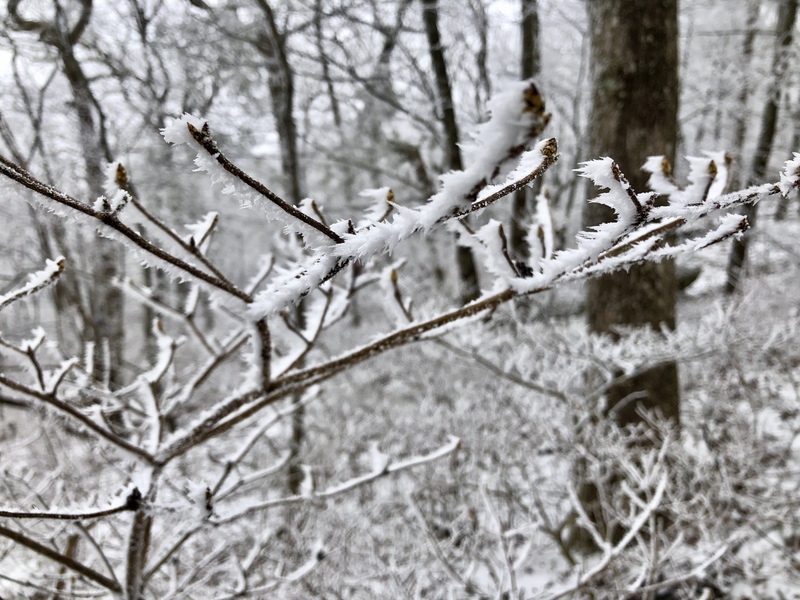 We woke up on Wednesday morning at Gooch Mountain to snow on the ground and a falling thermometer. Luckily, I had reserved a cabin at Blood Mountain Cabins for that night, because I knew it would be a garbage day and I would want to not be outside at the end. We all packed up and got ready to make the 16 miles over Blood to Neel Gap. 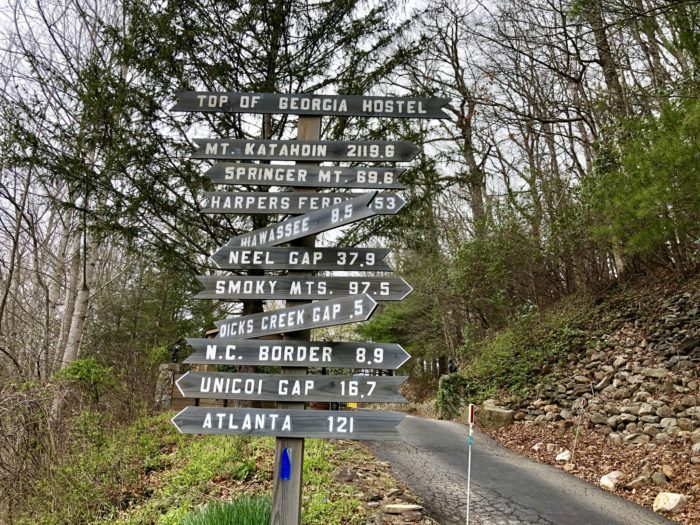 I left first and got to Woody Gap surprisingly fast. There were some snowplow drivers there who looked at me like I was crazy, and I hurried across the road to the little pit toilet building. The wind was howling through the gap – as loud as a jet engine. I huddled in one of the bathrooms with some people I barely knew, they gave me some hand warmers (I still haven’t used them), and I checked Guthook (a hiking app) to see what the next 10-plus miles had in store. I popped out, ready to go, and this kid asked if he could hike with me. Sure, why not. Who wants to freeze alone? That’s how I met The Worm. Can you imagine being 18 and going out to thru-hike the AT? Well, he’s doing it. Ice crystals from our frozen trek over Blood Mountain. We booked it through snow, horrible wind, and really limited visibility for a few hours. We signed the register in the shelter at the top of Blood (this shelter is definitely haunted) and got off there as quickly as we could. We got our cabin – The Worm ended up joining us, because that’s how things work out here: hi, nice to meet you, want to go in on a room with us, great, oh by the way what’s your name? The endless frozen pizzas and soda tasted even better after hours spent in the snow. Trying to be happy instead of frozen. We took a zero the next day at Mountain Crossings, and it was great to take the day to put the brakes on and rest a bit. So many people out here remind you that it’s not a race; if you start too hard you’ll burn out fast, and that the last one to Katahdin wins. All of this comes down to one of the most important rules of the trail: hike your own hike (or HYOH for short). Treat your hike the way you want it to be treated. It’s your hike, listen to what your body is telling you, hike the miles you want to hike that day. If you want to sit at the top of Albert Mountain for a few hours and bask in the fact that you just walked the first 100 miles of the AT (also because the sun just came out for the first time in four days), you should do that. This is something that I’ve been keenly aware of over my first week. I’ve fallen in with some really great guys (Red Coat, Sherlock, Achilles, the Prophet), and maybe we will make it together to the end, maybe we won’t. But it’s the people out here who pick you up and help put the pieces back together when you’ve been walking for miles feeling sad or lost. They may not know it, but they do. An encouraging and terrifying sign at the Top of Georgia Hostel. The first week was a big adjustment. And I’m still adjusting. Some good things have happened: I got a proper tent footprint, an excellent sleeping bag liner, I’ve got a good working relationship going with my water filter, my feet and ankle are feeling pretty great. I’m in North Carolina now, and will be heading into the Smokies in a few days. I made it to N.C., I made it to 100 miles, and when I make it through the Smokies, I’ll feel really great. My favorite perk of the trail so far: eating an entire bag of potato chips as an appetizer to dinner. 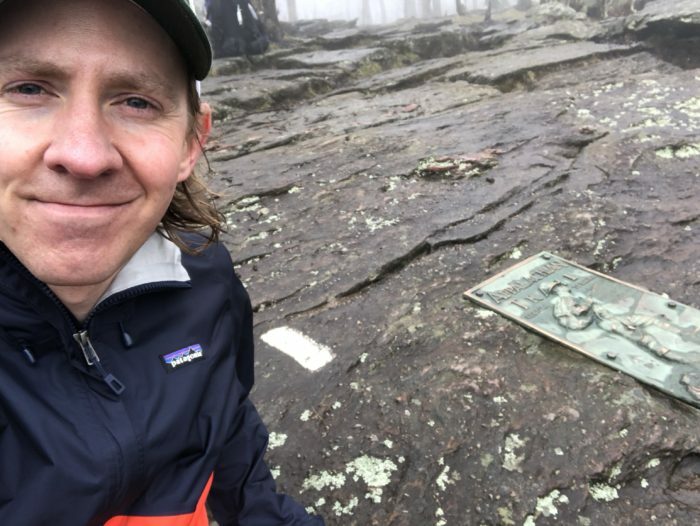 Hey Danny…Jerry here, 54, Texan and have wanted to hike the AT for a few years now. Don’t know when I will get to go, but until then, YOU GO BOY! I will have to follow the posts of those fortunate enough to be doing it now! I followed DIXIE a few years ago too! What filter are you using? Enjoy thetrail! Sounds like you are doing great!!! Really hoping that I will be able to chew through some miles with you when you get north. Tell me, if you go it alone, how do you know which way to hike (dumb question I know)? What I mean is, could someone actually walk this alone and never get lost off trail? I would hate to not see a marker and go off in some off hand way, the wrong way and totally flop.